This article is about the film. For other uses, see Rad (disambiguation). 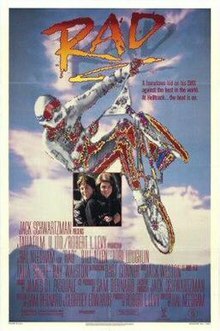 Rad is a 1986 American sports film directed by Hal Needham and written by Sam Bernard and Geoffrey Edwards. The film stars Bill Allen as Cru Jones, a young BMX racer, alongside Lori Loughlin and Talia Shire. The film's story focuses on Cru Jones (Bill Allen), a young BMX racer who lives in a small town with his mother (Talia Shire) and sister. Cru is faced with a tough decision: qualify for Helltrack or take the SAT in order to attend college. Winning Helltrack means $100,000, a new Chevrolet Corvette, and fame. Cru chooses the former option, ignoring his mother's wishes. The Helltrack race is endorsed by the city and a duplicitous Duke Best (Jack Weston), president of The Federation of American Bicyclists and owner of Mongoose bicycles. Best keeps adjusting the rules in order to keep Cru out of the race and to ensure BMX star Bart Taylor (1984 Olympic gymnastics champion Bart Conner) has an easy road to victory, thus providing a financial windfall for Mongoose Racing, Bart's sponsor. Racers from all around come to the small town for the Helltrack and Cru meets Christian Hollings (Lori Loughlin), who becomes Cru's romantic interest. Christian and Cru meet at the local high school dance where, instead of dancing like the other couples, they perform freestyle bike stunts on the dance floor to the awe of many. After being blocked from the race due to a last minute rule change on participant sponsorship, Cru is ready to give up his dreams of winning Helltrack, until his younger sister Wesley gives him a shirt to wear at Helltrack reading "Cru is... RAD." Cru and his friends then come up with an idea for him to still enter the race. Using the $10,000 Cru won from qualifying, they start up "Rad Racing," a small T-shirt business. However; days before the race Best changes the rules yet again claiming any company sponsoring a racer must be worth $50,000. When the towns people hear about this they rally around Cru and his friends and with their contributions along with a generous donation from a wealthy local, Mr. Timmer (Ray Walston) Rad Racing comes up with enough money and Jones is finally able to enter Helltrack. During Helltrack, Duke Best gets the Reynolds twins to try to take out Cru, to no avail. In the final lap, Bart, who leads the race, slows down so that he and Cru can face each other one-on-one in the final stretch. Cru ultimately wins Helltrack, and Bart Taylor is kicked off the Mongoose team. In the final scene Cru offers Taylor a spot in Rad Racing. The film was partially shot in Cochrane, Alberta, Canada, as well as at Colonel Macleod Jr. High School and Bowness Park, both in Calgary, Alberta. The film received negative reviews during its release. The New York Times stated "Teen-age ears may not split from the music or ache from the dialogue, but anybody over 20, beware: 'You're willing to sacrifice a solid future for a bicycle race,' says the hero's mother. 'It's very self-destructive.' If only he had listened to mom – but who can blame him for preferring his bicycle?" On the website Rotten Tomatoes, "Rad" was given a "Rotten" rating of 0%, the lowest possible score from critics; conversely, the audience rating stands at 91%. The Guardian writer Nick Evershed found it had the largest discrepancy between audience and critical reception in the Rotten Tomatoes database, from a pool of 10,000 movies analyzed. Film historian Leonard Maltin gave the movie a "BOMB" citation - the lowest possible rating in his TV, Movie & Video Guide - explaining, "Title is supposed to be short for Radical...as in, 'Radical, man!' Yeah, right...and we didn't see this same plotline used to death by 1950's hot-rod films, as well as 1970's roller-disco epics!" The film was released on VHS and LaserDisc in 1986, where the film quickly found a following and became a top-ten video rental for two years after the film's release. The soundtrack was released on 12" vinyl and cassette, by Curb Records in late 1986, and featured various artists including John Farnham in his pre-Whispering Jack days, 3 Speed, Sparks, Hubert Kah and Real Life. On February 9, 2014, it was released for digital download at the iTunes Store. Farnham's "Break the Ice" was featured on a special list of the best songs from '80s action film montages that appeared on music website, No Echo. ^ "Rad". The 80s Movie Rewind.